Schlumberger introduced surface resistivity measurements in Russia and its satellites around 1920, the Electrical Survey in 1928, and the SP in 1930, The term "Russian-style logs" is usually applied to the electrical survey and gamma ray neutron tools developed in Russia after Schlumberger was forced out of the country in 1936. This event, and the five months of failed negotiations and lousy food that preceded it, may have contributed to Conrad Schlumberger's death from a heart attack in Stockholm, on his way home to Paris from Moscow. The Russians could easily copy the ES. They had confiscated all the Schlumberger equipment and held the crews for several months before releasing them to return home to Paris. The Russians attacked the subject of electrical logging with vigor, developing a multitude of tools with a multitude of spacings and electrode arrangements. The equivalent of the Schlumberger ES Normal curve was called a Potential curve (PZ) and the ES Lateral curve was called the Gradient curve (GZ). The tool that ran the lateral curve is called a BKZ logging tool. A Spontaneous Potential (PC) curve was recorded with each log run. 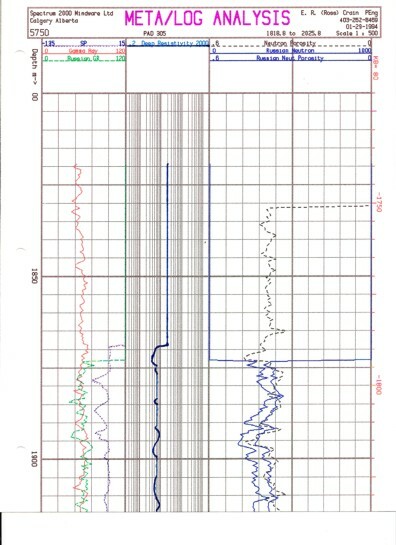 Only one resistivity curve plus the SP could be recorded on one pass into the well bore, so multiple passes were made to get alternate spacings or electrode configurations. In the early days, this meant that the crew carried a host of different logging tools to the wellsite. Later, a multi-electrode tool was built; jumper wires at the top of the tool allowed the operator to change the electrode configuration without changing tools. The original log with one resistivity curve and the SP was recorded on paper with a stylus or pen recorder, and later on photosensitive paper with a galvanometer. 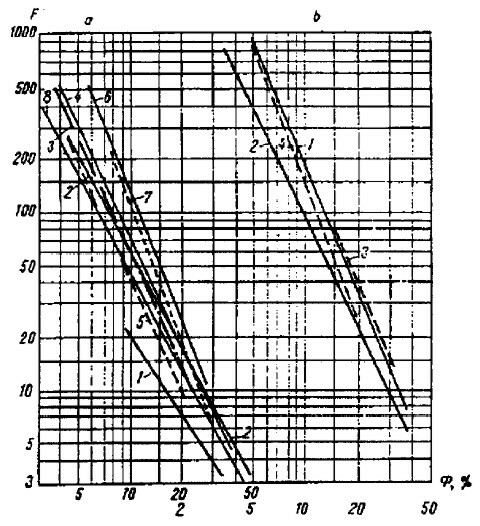 A primitive gamma ray log (GK) and neutron log (NGK), similar to Schlumberger's GNAM and GNT tools, were in evidence by the early 1950's. In the West, two Normals, a Lateral, and an SP could be run simultaneously, using an ingenious electrode switching device called a pulsator. It was a highly sophisticated motorized rotary switch, but very simple in concept; it is surprising that the Russians never duplicate this method of multiplexing several measurements from a single tool. 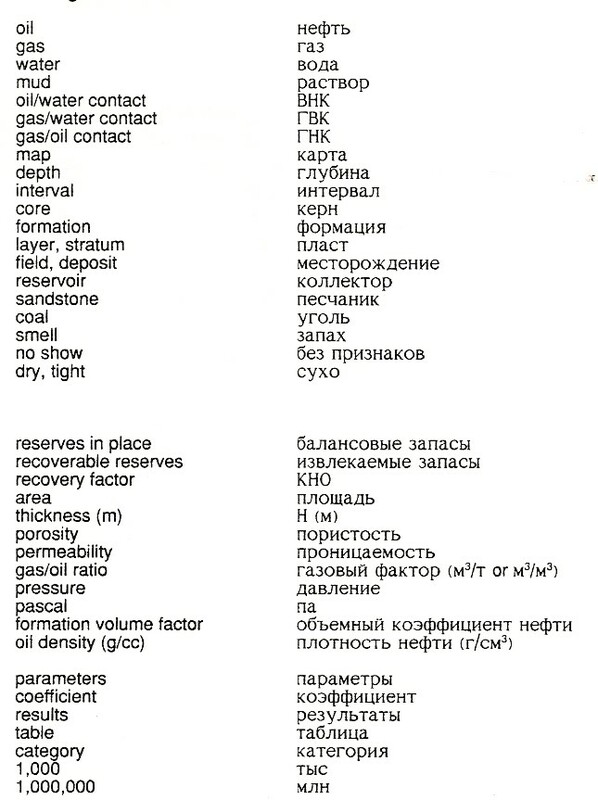 A sample pf a Russian log, from "Russian Style Formation Evaluation", London Petrophysical Society, 1994. The Unknown Curve is the SP. Notice the lack of track boundaries, line codes, curve names, scales. Russian logs were made with multiple passes to get all the curves. They were often run in numerous short sections as the hole was drilled. All the curves were then re-traced by hand onto a new composite log. I have seen as many as eight resistivity curves strewn together, plus SP, GR, and neutron on a single graph. The original would have been drawn with coloured pencils but we only get black and white prints. There are no line codes or annotation on these logs; curve shape and character are all we have to separate one from another. Scales and depth numbers were handwritten in ink or pencil; many are completely illegible so you need to compare to other wells with slightly more legible data sets. Later, they developed the equivalent of the Schlumberger Laterolog-7 (BK7) and the Laterolog-3 (BK3), as well as Micrologs and Microlaterologs. In time, they developed an induction log (6F1) similar to a Schlumberger 6FF40, one and two receiver (or two transmitter) sonic logs (AK), a two-detector thermal neutron log (NTK), and a gamma-gamma density log (GGK). Unfortunately for Russia and its neighbours, the more modern technology, easily available in the West, was slow to develop and was not widely distributed. Western Siberia fared the best with numerous sonic and induction logs. The situation has improved considerably in Russia since 1995 when Western service companies made significant progress, but many of the Republics have not done so well. Until recently, the Russian induction log measurement was presented as a conductivity curve, as there was no reciprocal circuit to generate a resistivity curve. No skin effect or shoulder bed corrections were applied at logging time and the maximum resistivity range was 0 - 20 or 0 - 40 ohm-m, depending on tool type. The "K" at the end of each tool abbreviation stands for the Russian spelling of the French word for "well log", "carotage", spelled with a leading "K" (Karotage). WHERE ARE RUSSIAN STYLE LOGS FOUND? These tools were built by or sold to all the Republics that formed the former Soviet Union in Eastern Europe and most of Asia, north of a line above Iraq, Iran, Pakistan, India, and Bangladesh (see maps below). Some were sold to China, who promptly started making their own versions. Russian-style logs can also be found in Cuba, Viet Nam, Yemen, and possibly in Sudan, Indonesia, and elsewhere where a flirtation with the Communist political system took place in the 1960's. The Potential, Gradient, SP, and uncalibrated neutron and gamma ray logs are still being run today in many areas of the former Soviet Union. The ES log may be dead in the West, but it lives on in less developed countries which have maintained their government controlled oil and gas industries. Countries east of the red line in Europe have Russian style logs in their well files, including East Germany, Ukraine, Poland, and Hungary, which are mostly using modern Western logging equipment today. FSU Republics like Albania, Rumania, and others still run their own Russian style logs, sometimes with Western logs run in parallel, depending on the nature of the joint venture agreements. Most of Asia north of Iran and India still use some Russian style logs, with Western versions on some newer wells, based on specific joint venture agreements. China has had agreements with Western service companies for some time, but the old tools can still be used in more remote regions. Russian style logs were difficult to analyze, even by Russian-trained experts, so many "research" wells were cored over potential hydrocarbon zones. Unfortunately, these cores were treated as "spot" analyses of 1 or 2 data points from a 5 meter core. This porosity and permeability were then assigned to the entire reservoir. Depth control was abysmal, so comparison to any log analysis result is difficult. SWir = irreducible water saturation (capillary bound water). Thus PHIeff is the porosity that could hold hydrocarbons. This has sometimes been called "useful" porosity in the West and is equivalent to the "moveable fluids" in an NMR log analysis model. How SWir is determined for the Russian core analysis report has not been defined in the references available to me. Further confusion is caused by the abbreviations used in Russian reports of all kinds. For example, all laboratory measured rock properties are abbreviated with the letter "K", representing the word "coefficient". Thus Kn is total porosity, Kpo is open porosity, Knp is permeability. Kh represents oil saturation (not horizontal permeability), Kb is water saturation. 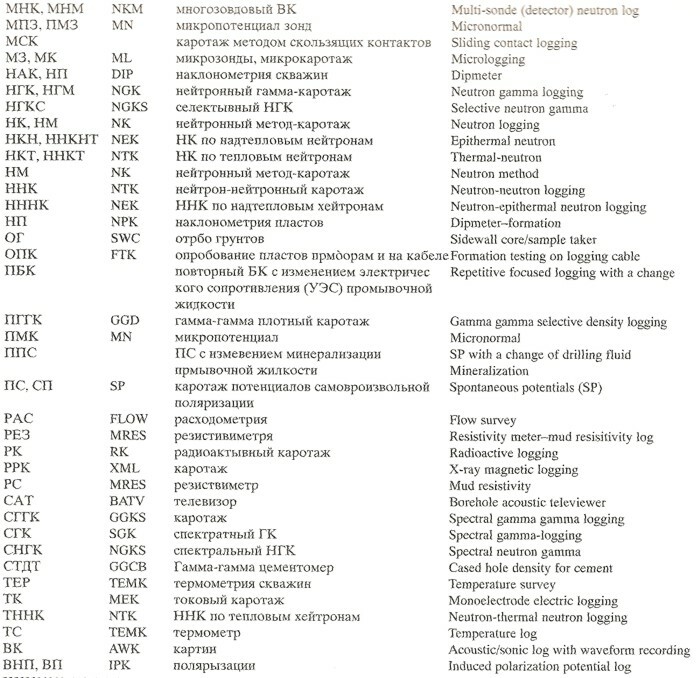 The subscripts are Russian alphabet, not Roman, so be very careful and read the full words in the report..
Keywords that might appear in a core report. Western exploration companies who want to work these areas should acquire and translate the core and sample descriptions. Since it is nearly impossible to calibrate porosity calculations from the unscaled neutron logs without some core control, it is also critical to transcribe all the porosity and permeability data into spreadsheets. Except for translation, these are the same steps we would use to calibrate our work with Western style logs. I have worked with these logs from Siberia, the Volga region of the Ural Mountains, Kazakhstan, Uzbekistan, Viet Nam, Rumania, Albania, Cuba, and China. 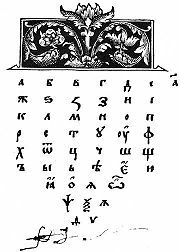 Headings were in the language and alphabet of the country. Some of these were run as recently as 2008, others were over 50 years old. The last ES run in North America was around 1964, although we carried one around the Canadian Arctic Islands into the late 1970's as a "backup" tool. It really helps if you can memorize the pronunciation of the Cyrillic Alphabet, since many technical words and tool mnemonics will sound similar to their English or French counterparts. 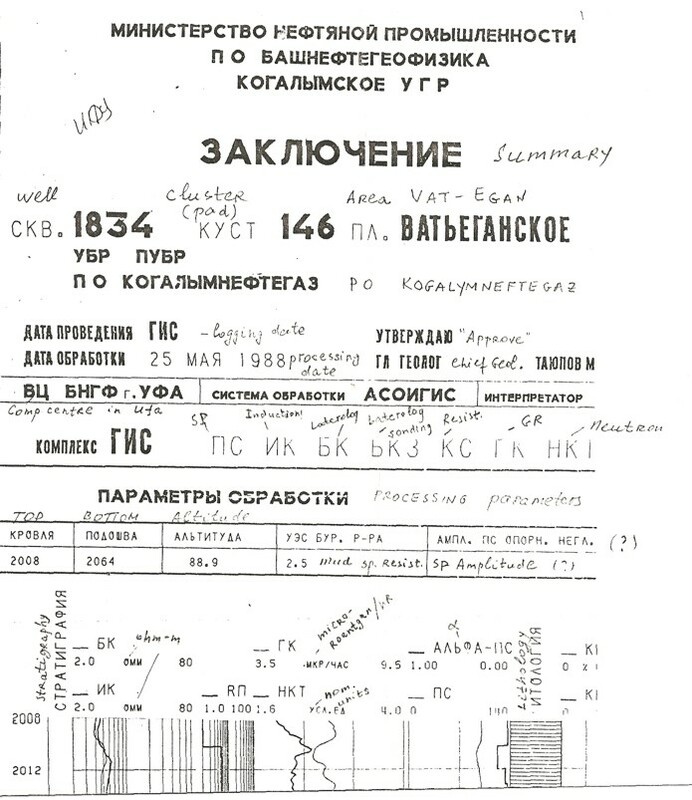 Sample of a modern Russian log from Siberia drawn by computer from data on digital tape, circa 1990. Curves are, from left to right, normal and lateral resistivity, calculated deep resistivity (squared log on logarithmic scale), neutron, GR, SP (and ALPHA = VSH from SP), and lithology description. This is a composite log generated from the individual logs run on this well. This is the most legible heading I have ever received. A more typical log heading with curve scales is shown below - hand written data, hand traced curves are the norm. There are no "log tracks", line codes, or curve identification anywhere on the log. 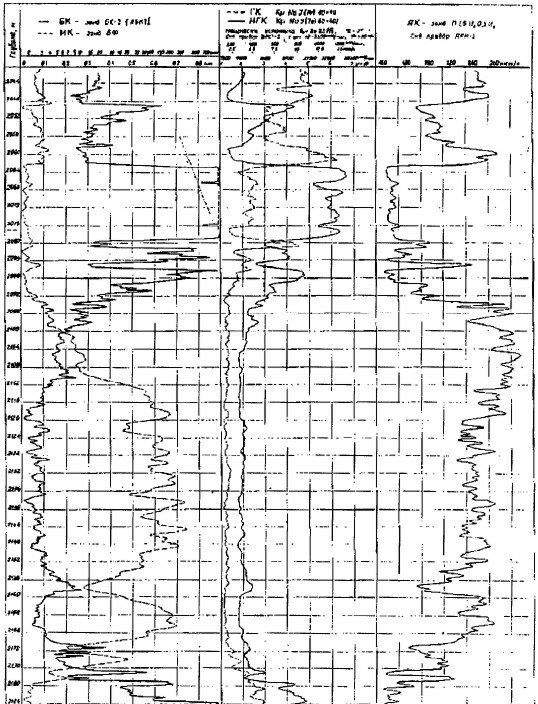 Top few meters of a Russian style log from Albania, showing electrode spacing and resistivity log - scale is 0 to 20 ohm-m across 8 cm of graph paper. Backup scales are often present, sometimes unstated.. This is a 1.9 meter lateral curve because AM > AB spacing. SP is labeled PS and curve deflects to the left for cleaner sandstone - scale is 25 mv across 5 cm of graph paper. This is the most legible log heading of about 300 in this project. There are only two curves so it's not too hard to tell which is which. The spacing of the lateral and normal curves is noted at the top of the log near the scale (both handwritten), as for example B2.5A0.5M or M0.75A3B. The letters represent the standard Schlumberger electrode nomenclature and the numbers represents the electrode spacing in meters. For a Normal curve AM is always less than AB. The same electrode arrangement with different spacing can make a lateral curve, for example B0.25A2M, where AM is greater than AB. A "Russian style" log from China, circa 1986. 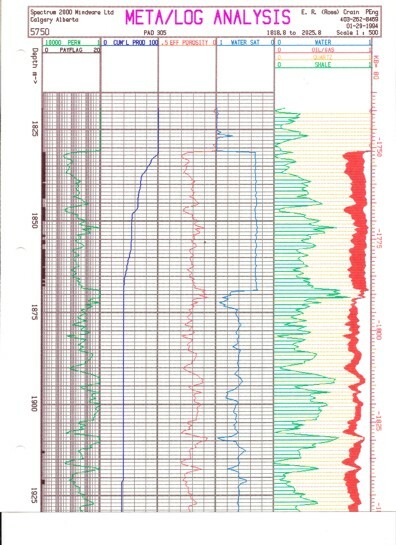 This is a composite log with SP and a long normal resistivity curve, shaded black where hydrocarbon has been interpreted to be present. Sample descriptions are on the right. Many logs in Russia proper were stamped "KGB Secret" and, at least in the early days after 1991, were filed in different government agencies by log type. The oil production operator had the resistivity logs but a research group elsewhere had the sonic logs. Core and rock data were in a third location with no communication between them. This is still true in some of the less progressive jurisdictions. Since the fall of the Soviet empire in 1991, Russia and most of the Eastern European and Western Asian republics have opened their oil industry to Western service companies. Schlumberger, Baker Atlas, and Halliburton logs can now be found in many of these formerly "closed" countries. It is essential to compare the Russian style logs to modern Western style logs or modern Russian equivalents, just as it is necessary anywhere else in the world when using "ancient" logs. Russian Normal and Laterologs, both symmetrical curves, are similar in all respects to their Western counterparts, except the spacing AM is measured in meters or 10ths of meters. Most tools could only measure one curve at a time, so they were successively traced onto a composite log that was the final product. Most Normal curves have short spacings of 0.25 to 0.5 meters (10 to 20 inches). Long normals are rare. Laterolog spacings were usually 1 meter. The lateral curve on a BKZ tool is not symmetrical and leaves a blind spot at the top or bottom of a resistive bed (pay zones). This was also true for ES logs run in the West up to about 1964 when the induction log finally replaced the last ES. The usual practice in most parts of the world was to run the electrode arrangement, called the inverse lateral, that puts the blind spot on the bottom of the reservoir. Most Russian logs have the blind spot at the TOP of the reservoir, but either arrangement is possible. Many wells have both so top and bottom of reservoir layers are sharply defined. Spacings run from 1 to 12 meters. Typical Western lateral curves were 5 to 6 meters (15 to 18 feet). The blind spot is the thickness of the tool spacing, a few to several meters for typical Russian and Western tools. The blind spot shows low resistivity when it ought to show high resistivity. The lateral curve can be used for handpicked data by following special rules. Because the lateral curve has a blind spot over the top or bottom of every resistive zone, it cannot be used in computer aided log analysis unless some special techniques are used. 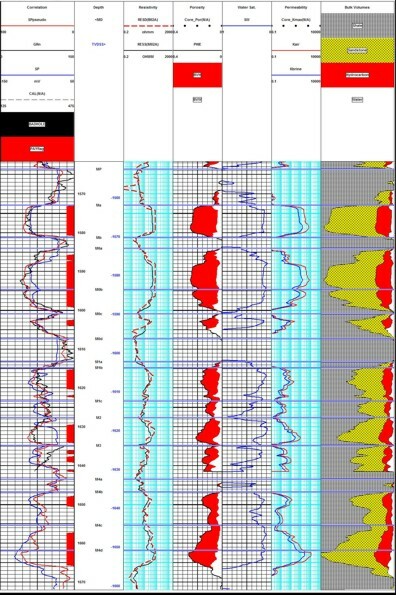 One approach is to pre-process the data with resistivity inversion software. However, even this sophisticated software is a poor solution, as it tends to draw a straight line through the blind zone, which you or I could do faster and cheaper with a red pencil. Another, more practical, solution is to ignore the lateral data in the blind spot by using appropriate logic in the analysis script, and use a different technique such as Buckles number in these intervals. Water zones must be zoned, but otherwise the technique seems to work well. Depth control was abominable and considerable effort is needed to get the various curves on depth with each other. I use the shallow Normal as the depth reference and move all others to match. The GR may be preferred if it has decent character and is not among the missing. Be sure to find out if the blind spot is on top or bottom before moving lateral curves. Below is a sample Russian log illustrating the confusion of overlapping curves that are commonly seen. - nice round numbers to work with. This log has 0 to 40 ohm-m primary scale with offset 0 to 600 backup scale over a pay zone. The depth number at top left is 1500 meters, at the bottom left is 1600 meters - you'll have to trust me on this; I counted from 100 meters to verify. The SP appears to be a dashed line in places. Dark area is a splice in the graph paper. Most FSU wells were drilled with "native mud' so invasion could be quite deep, making SW calculations somewhat erratic. The use of multiple spacing lateral curves was intended to overcome this. The following two illustrations show the changes in resistivity as the tool spacing or tool type is changed. 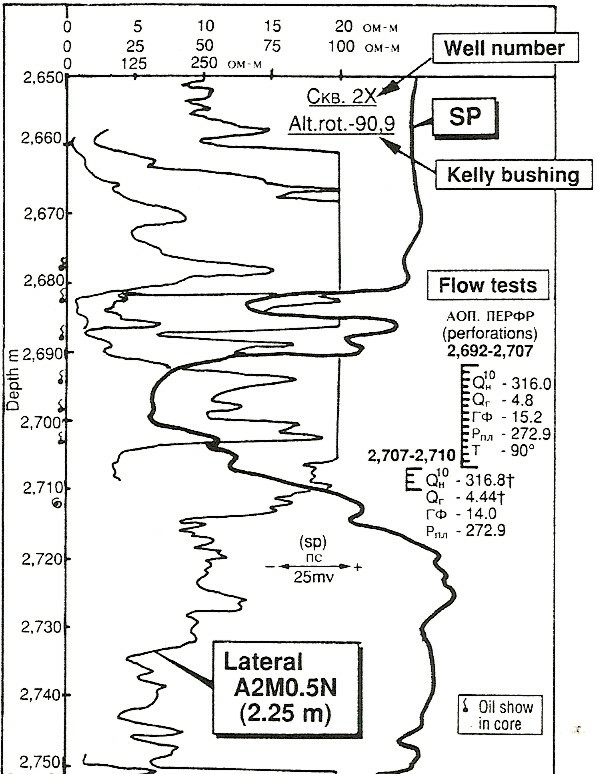 Both images are from "THE ESSENTIALS OF BASIC RUSSIAN WELL LOGS AND ANALYSIS TECHNIQUES" by N. A. Wiltgen, SPWLA 1994. This log suite has the following logs: (from left to right) micro lateral, micro normal, SP, 0.45m lateral, 1.05m lateral, 2.25m lateral, 4.25m lateral, 8.50m lateral, and a microlaterolog. This log suite has a laterolog-3, induction conductivity, gamma ray, gamma-neutron, and acoustic curves. Every curve is recorded on a separate pass into the well bore (except GR can be recorded with neutron counts) so depth shifting to reference curve (usually the cased hole GR or open hole shallow resistivity) can be a tedious task. 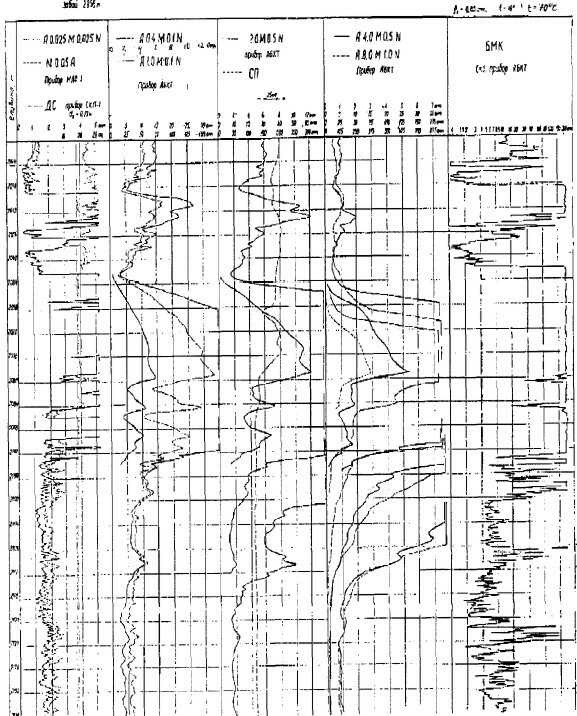 There are charts for environmental corrections to Russian logs, similar to the early departure curve books published in the West during the 1950's. My copy is dated Moscow, 1984 and runs to 180 pages, entirely in Russian. 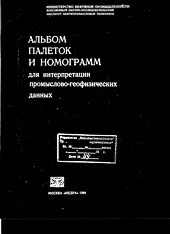 It was provided by Halliburton around 1992, reproduced from a Russian Ministry of Oil Industry Geophysical Research Institute chartbook. The general approach used by the Russians was to calculate formation factor from a shallow resistivity log and mud filtrate resistivity, then calculate resistivity index from deep resistivity, after applying all the borehole and invasion corrections to each resistivity curve. This is exactly what petrophysicists in the West did after Archie described his work in 1942. Where SXO = 1 - ROS is assumed based on expected oil gravity or from observation of residual oil in cores. Even though this is a well known and formally correct approach, most Russian analysts, and those from the West using older Russian logs, prefer the PHIe = PHIMAX * (1 - Vsh) approach. This is described as the "Porosity from the SP" method in the literature. Westerners generally prefer the GR to the SP for this, but either or both can be used (see next Section below). One reason for this is that RMF was not measured or reported in many cases, and the Russians were fond of experimenting with different mud resistivities in the same borehole, making it difficult to tell what RMF to use in the calculation. PHIMAX came from the "spot" core analysis data. RT, the true (deep) resistivity, came from the laborious manual calculation that corrected for borehole effects, bed thickness, and invasion. 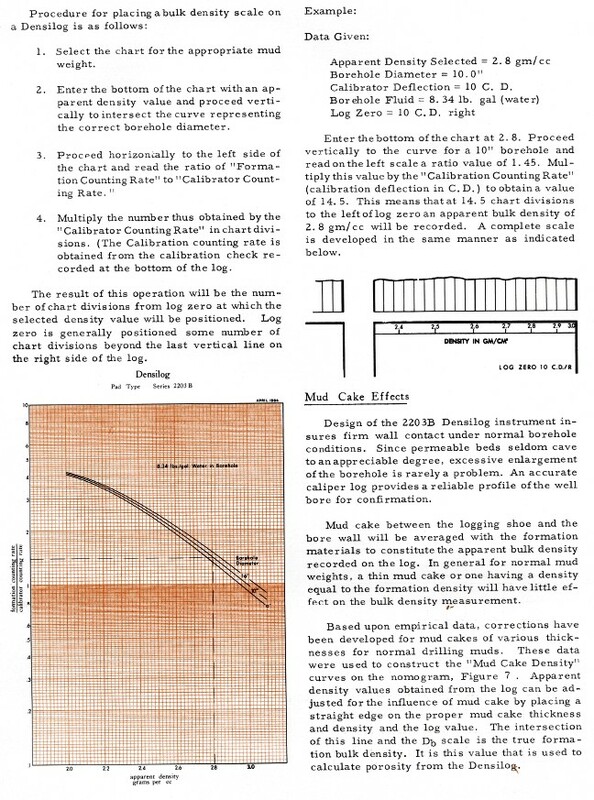 In the West, we moved on to use calibrated porosity indicating devices instead of shallow resistivity beginning in 1958, and have continued to improve this technology. Russian technology fell far behind, so Archie's methods based on the ancient ES design persist to this day, because more sophisticated logs are too expensive for most FSU countries, unless they are run by Western joint venture partners. Below are formation factor and resistivity index plots for a number of Russian oil fields. The slope of a formation factor line is the cementation exponent M and the intercept at 100% porosity is A*RW. The slopes on the resistivity index lines are the saturation exponent N.
The small symbols represent individual oil fields, see the Wiltgen paper for details. The Archie model and its shale corrected versions work well, as long as you do something about editing the asymmetrical kateral resistivity curves. Water saturation vs resistivity index for five different Russian oil fields, see Wiltgen paper for details. 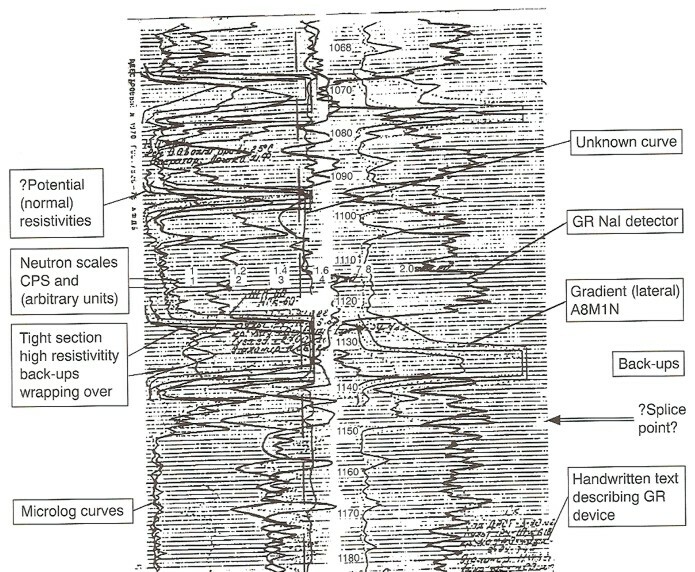 Gamma ray logs, usually abbreviated GK, were often run in casing and traced onto the composite log long after the resistivity logs were measured. Slow acting Geiger-Muller counters were replaced by sodium iodide (NaI) much later than in the West. The scale was in Roentgens/hour (r/h) or micrograms Radium equivalent (ug Ra eq). Multiply these scales by a factor of 10 to get a gamma ray excursion that approximates an API Units log. The log wasn't calibrated to any standard and many are pretty insensitive. Both measured relative to a shale baseline. PseudoSP is a mirror image of logarithm of resistivity and is often a better shale indicator than GR or SP. RESD must be from a long normal or a laterolog (or an induction log) which are symmetrical curves, and NOT from a lateral curve, which has a blind spot on top or bottom of pay zones, depending on electrode arrangement and spacing. RESS is usually a short normal. Choosing PHIMAX from a plot of Vsh vs PHIe from offset wells or core data, high porosity at high Vsh on this plot is from bad data in rough borehole. In this example, PHIMAX = 0.37. Neutron logs, usually abbreviated NGK, were the neutron-capture gamma type common to Schlumberger and others in the 1950's. The detector was very inefficient and count rates were measured in counts per minute (cpm). Later tools were scaled in counts per second (cps). Count rate is inversely proportional to porosity. Charts for specific tools, such as the one shown at the right, were available to assess porosity. Neutron counts per second vs porosity for a typical Russian tool with 60 cm spacing in open hole in limestone. Most neutron logs are run in casing and in sandstone, so this particular chart will not be terribly helpful. Porosity equations for near detector, far detector, and ratio for both thermal and epithermal NTK type tools are available, again for unstated hole conditions. Hole size and mud weight were accounted for, just as we did for Western logs of the same type. The charts, however, are hard to find, so alternate methods are usually required. The transform to porosity is usually done with the High-Low semi-logarithmic scaling method. Two detector CNL-type tools showed eventually but only count rates were displayed on many of them. You have to calculate the ratio yourself and transform to porosity by curve fitting to ..?? 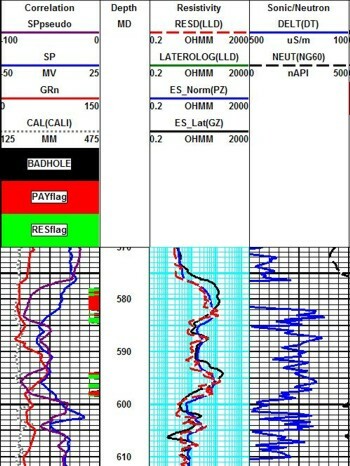 Some LAS files contain a neutron porosity curve generated by the logging equipment or the digitizing service company - you still need to apply shale corrections and calibrate to ground truth. Semi-logarithmic crossplot of Russian neutron log data in counts per second versus porosity from a Western neutron porosity log. Similar plots can be made using core porosity to calibrate Russian neutron logs. Typical accuracy of this type of log is about +/-3% porosity at all porosity levels, about three times worse than a modern neutron log. Logarithmic scaler for reading porosity from an un-scaled neutron log. 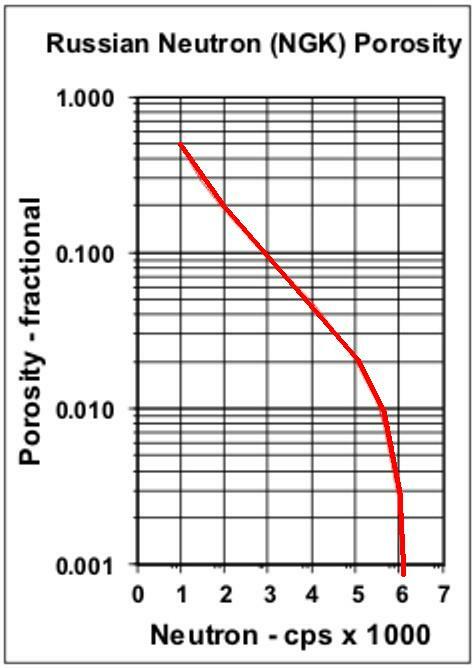 Draw vertical line on log at low porosity point (say porosity = 0.05) and another line at high porosity point (usually a shale - say porosity is 0.30). 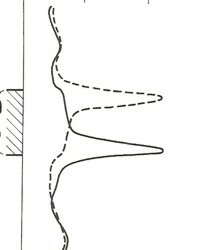 Align scaler between the two lines, setting 0.05 on scaler at low porosity line, and 0.30 on scaler on high porosity line. Skew scaler to obtain good fit. Mark other porosity points on log. Enlarge or reduce scaler in copier to fit smaller or larger logs. 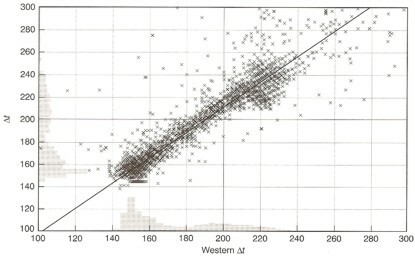 High and low porosity points are a matter of good judgment tempered by core or log analysis results from wells with modern logs. Russian sonic logs are in microseconds per meter, mostly uncompensated. Older tools are single receiver tools that invariably read too high because of the travel time through the mud. Unfortunately some of these seem to be still in use. More recent tools are borehole compensated (BHCS) types, and others have additional receivers approximating an array sonic log. There is no mention in the literature of shear sonic logs. Many Russian sonic logs give unrealistic porosity values, others have chronic cycle skips, mostly to high values. Russian density logs are mostly recorded in counts per second. You get to work out the transform to density using a semi-logarithmic High - Low porosity technique as described above for the neutron log. Here, high count rate = low density = high porosity. There are published equations for this, but the parameters required are seldom available, so they are not reproduced here. Semi-log crossplots of count rate versus core density or core porosity will resolve this dilemma. 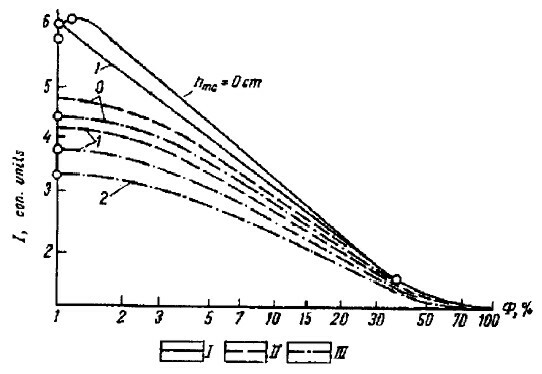 This chart is for a Schlumberger counts per second 1960's density log, to illustrate the semi-log relationship that is to be expected for a Russian density log. A compaction correction KCP = DTCSH / 328 is needed for shallow unconsolidated sands, as well as a gas correction when appropriate. In recent years, he Russians favoured the HuntRaymer non-linear equation over the Wyllie time average shown above. Most tools were single detector, uncompensated types. These are severely affected by hole size, mud weight, mud cake thickness, source type and strength, source detector spacing, and detector efficiency. The High-Low calibration method compensates for all these problems, but available charts do not. In the earliest versions of these tools, the source strength decayed at the rate of about 1% per week, so count rates definitely need to be normalized on a well by well basis. Similar tools, with better sources, were available in North America in the mid 1960's. I actually ran such logs in slim sulphur-exploration strat holes in the Canadian Arctic Islands in 1969. Newer Russian density tools are dual detector with some degree of borehole compensation, and some are scaled in gm/cc. 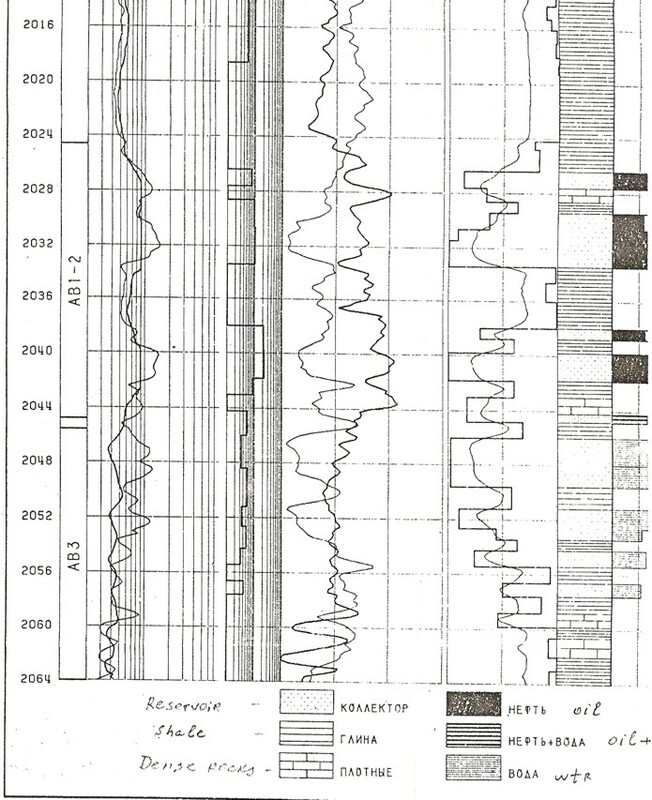 An alternate to the semi-log High-Low method was used with early neutron and density logs in the West as well as in Russia. This involves "relative count rate excursions" and service company charts of these values versus the desired rock property (porosity, density). The problem, of course, is that you need the chart unique to each tool and sufficient patience to do the constructions. Below is the instruction set developed by Lane Wells from their 1964 Technical Bulletin on their Densilog Tool.. 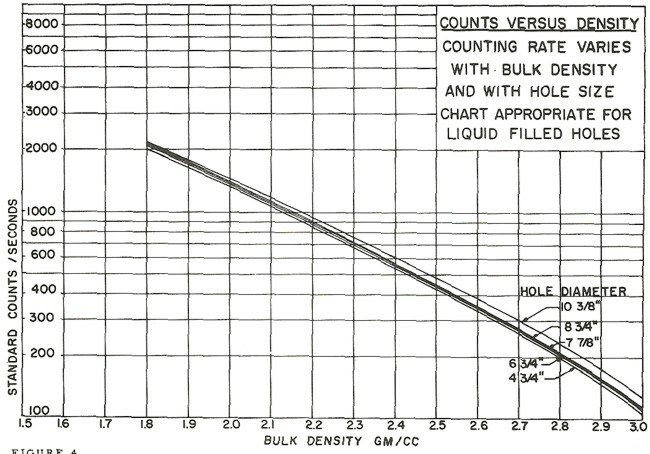 Instructions for the "relative deflection" method for transforming density log count rates to density, from the 1964 Lane Wells Densilog Technical Bulletin. Full size response charts are in the same book, but Russian equivalents are scarce. 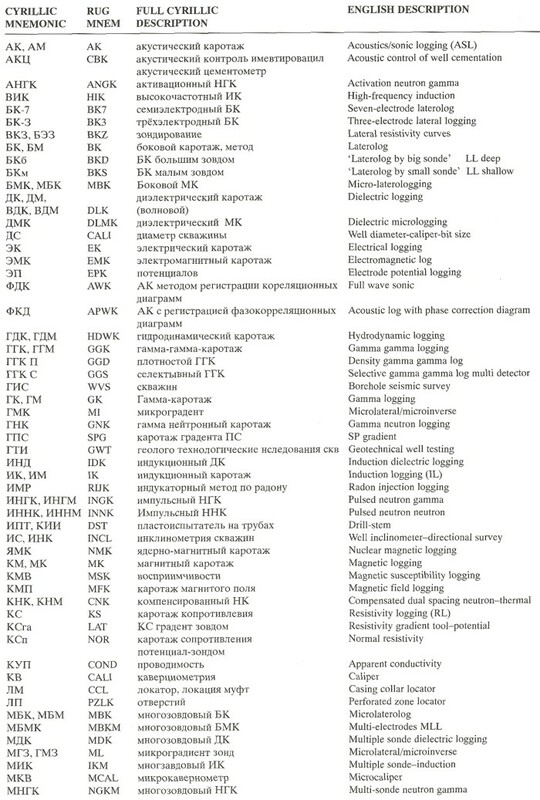 The names and curve complement on Russian logs take a little study. The table below lists the curves available and a useful name for each. Note that curve names in LAS files are quite different from this list. You will need a cross reference table from the digitizing agency to correlate the LAS curve name to a Russian curve name. In the last few years, there has been a strong trend towards inverse modeling of all forms of resistivity logs, especially Russian Lateral curves. This is due to the availability of computer code that performs an exact inverse solution to model the resistivity, similar to that in use for focusing the array induction log. By programming the tool geometry and extracting bed boundary data from a shallow, thin bed resistivity log, the inverse model of deep resistivity can be extracted from older logging tools. This includes dual induction and dual laterologs (which are still being run today) as well as the more ancient ES log curves. An example of resistivity inversion results for a 18'8" lateral curve (left) and an older style induction log (middle) compared to an array induction log (right). The SP is modeled in all three cases, and may be the most useful curve of the bunch. The modeling of the lateral curve gives a straight line through the blind zone, which leaves a lot to be desired. Modeling the 64 inch normal would probably give more realistic results. My case histories span a 20 year history of petrophysical analysis of Russian style logs on three continents. The only thing I learned during that period was that it never gets any easier; the uncertainty over which curve is which and the basic inadequacy of the tools and log presentation just won't go away. This is a modern job run recently. Only a short portion of the interval is shown. A sample of the raw logs was shown earlier, so it won't be repeated here. The reservoir is conventional oil, no water zones, in clean and shaly sands. Only one well out of 300 had a modern log suite for calibration. Six had core porosity. A long data prep period was needed to select curves, splice curves, and depth shift curves. To aid in depth shifting, we created a pseudo SP from the shallow resistivity and used it for a depth reference. SP pseudo = -50 * log (RESS / RSH). About half the wells had neutron logs. Each was scaled to porosity with the High-Low porosity method. Nearly every well had a gamma ray, so porosity was found from PHIe = PHIMAX * (1 - Vsh). PHIMAX came from the core data. Both porosity curves were compared on a well by well basis and the neutron was discarded where it made no sense. Resistivity was dominated by lateral curves with the blind spot at the top. Standard computer algorithms would have made a water zone at the top of each reservoir layer, so we used Buckle's number to generate Swb = KBUCKL / PHIe / (1 - Vsh). This worked well as there was no need to zone for water. After that, it's common sense and an eye for the ridiculous answer caused by scale or curve choice errors. 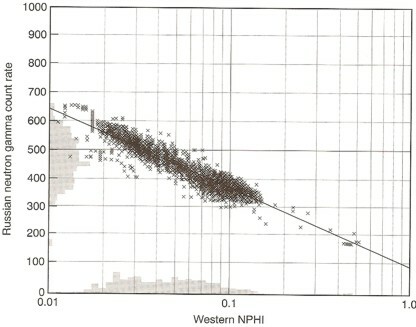 Albanian raw data on a Western style depth plot (left) and answer plot (right) can turn lead into gold. The flat spots on the resistivity are digitizing errors where the backup curve was ignored. Repeated requests for repairs went unanswered. This is an older job, run shortly after Russia invited Western participation in Siberia after the regime change in 1991. The confusion of log curves looks just like the examples shown earlier. The analysis model was about the same as the recent job described above. We did the digitizing ourselves so the data quality was under our control, except for missing data, which never came. 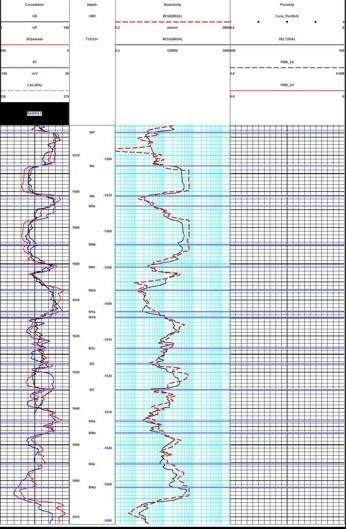 Raw data for Siberian example (left) and answer plot (right). Missing resistivity data was replaced with a constant value of 20 ohm-m as the zones are known to be oil producers. There's always something to fix. Correlation and mapping reserves were more of a political problem, as our work disagreed dramatically with the Russian version. Obvious correlations on close spaced wells had been ignored and moved up or down by as much as 50 meters. We learned in a roundabout way that oil discovery was done by "quota". If the B zone's incremental reserves were low, they merely called the A zone the B zone to boost reserves in the B zone. We flattened all these arbitrary "faults" and had much more realistic maps. Where Were Russian Logs Run?